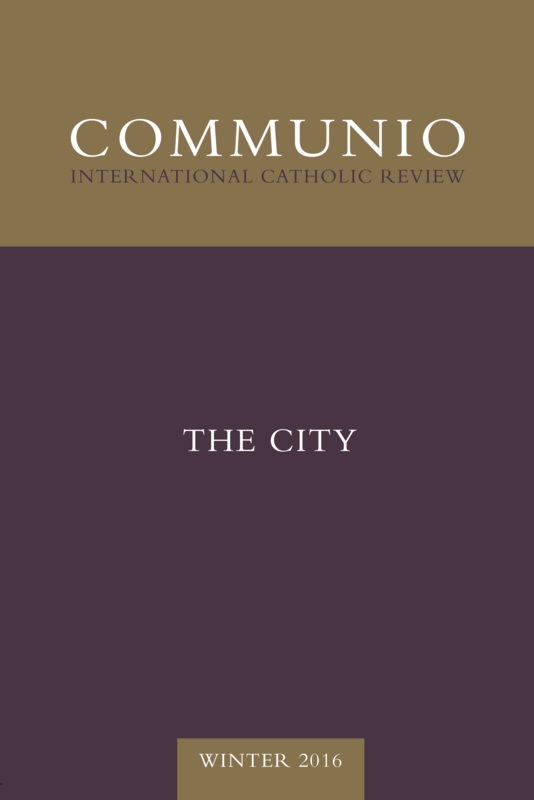 The Winter 2016 issue of Communio explores “The City.” Modern urban life challenges us to examine the principles according to which cities either foster or hinder the human person and community in their relation to God. Philip Bess reflects on good urban order in “City Stories of Nature and Grace: An Urban Pilgrim’s Progress.” A city’s architecture and objective pattern educates its inhabitants, whether poorly or well, in their role as “intermediaries” between the sacred and mundane. “Cities (like families) point beyond themselves to transcendent truths and realities of which their denizens may be but dimly aware, if at all.” In tracing the emergence and features of contemporary cities, Bess shows how a well-structured city is centered on the thriving of local neighborhoods and, by its very form, reflects the sacramental cosmos in which it is embedded. In “Political Life and the Horizon of the Human: Polis, Church and State, and Totalitarianism,” Mark Shiffman takes up Aristotle’s definition of man as a “political animal,” for this would imply that “in cities and as citizens, we discover and are able to enact what it truly and fully means to be human.” He explores three paradigmatic conceptions of the human person as citizen: the ancient, the Christian, and the modern. In “The Creation of the City of Man,” Giorgio Buccellati considers the origins of the city, focusing on the symbolic structures, such as writing, that made largescale communication and organization possible. “Writing was the perfect mechanism for that increase in the degree of control over reality that the urban system had institutionalized.” However, the same factors that enabled the formation of cities also brought the possibility of commodifying citizens, as exemplified above all in slavery. It is the personal creation of man, and his destiny in the city of God, that presents a foundation for an alternative vision even of the earthly city. Rodney Howsare, in “Flannery O’Connor and the City,” looks at O’Connor’s use in her fiction of the modern city as a “no place” whose anonymity circumvents those features of local culture and tradition that O’Connor calls “[m]anners, which derive from the accumulated wisdom of a particular group of people sharing life together over time.” She tries to “alert us to something that concerns us all”: how modernity’s nihilistic indifference to particularity is an implicit denial of the sacramental presence of God in things and places.